An extra 300 RSE workers will help harvest fruit in the Bay in 2019 – but it won’t be enough to solve the kiwifruit industry’s labour shortage woes. An estimated 300 extra Recognised Seasonal Employer workers for the Bay of Plenty’s 2019 kiwifruit harvest season will help alleviate pressure of a looming labour shortage – but the industry still needs to work hard to attract the rest of the workforce required. 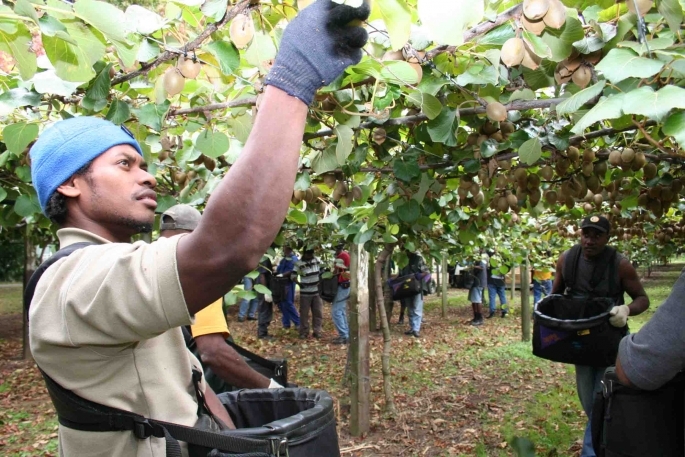 The Government has upped the number of RSE workers by 1750 to 12,850 nationally for 2019.But NZ Kiwifruit Growers Inc CEO Nikki Johnson says RSE workers make up less than 20 per cent of the seasonal workforce in kiwifruit. “Details of allocation are still being worked out but it looks like in 2019 the BOP can expect around 300 additional RSE workers. “And while the increase will provide stability to our workforce, the industry still has the challenge of attracting the remainder of the workforce that we need,” says Nikki. Horticulture NZ chief executive Mike Chapman is grateful the Government has lifted the RSE cap but says this sole measure will not be enough. “The RSE scheme cannot be the sole solution for all of NZ’s labour supply crisis.” In his column on page 9, he talks of how Australia has acted to solve labour shortages in its horticulture sectors. “Like Australia, our government needs to look to other solutions that involve both equipping the 100,000 or so unemployed New Zealanders for work and allowing other immigration options,” says Mike. The RSE cap is reviewed annually with NZKGI and other industry sectors providing information on supply and demand for seasonal workers to form a request to Government, if they want the cap increased. Last year, the Government increased the RSE cap by 600 workers but this didn’t meet demand and a labour shortage was declared in several regions including the BOP, says Nikki. “This increase in the need for workers in kiwifruit is a direct result of a quickly-growing kiwifruit industry combined with a low unemployment rate. “And although New Zealanders are the kiwifruit industry’s first priority when it comes to picking and packing kiwifruit, the low unemployment rate makes it difficult to fill all available positions. As result, the Minister issued four challenges to RSE Employers at their annual conference, to help solve the looming labour crisis. “One: Make the industry more attractive to NZ workers, by providing better wages and conditions. “Two: Build more accommodation for workers to alleviate local accommodation pressures. “Three: Take greater responsibility for supply chains and labour contractors to help stamp out migrant exploitation. Minister of Social Development Carmel Sepuloni says while it’s important the industry can access RSE workers in peak season it’s equally important they keep their commitment to employing New Zealanders. “The Ministry will continue to grow industry partnerships with horticulture businesses that’re committed to providing training and jobs for New Zealanders and grow a more skilled domestic workforce,” says Carmel. Iain says commitments from employers and industry will be supported by ongoing monitoring and compliance activity undertaken by Immigration NZ and the Labour Inspectorate. “The Government will be conducting a comprehensive review of the RSE scheme in 2019 to ensure it delivers improvements while remaining consistent with the original intent of the scheme,” says Iain.